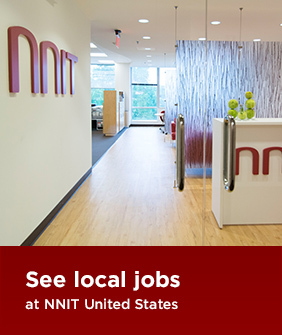 Be a part of NNIT’s expansion in the US. We are always looking for sharp, energetic life sciences professionals to join us. ​​​​​​​​​​​You will join an international team of highly skilled and dedicated colleagues in the US, working closely together with our affiliates in both Asia and Europe. We deliver integrated IT services and solutions that support the development, testing, production and marketing of drugs and medical devices in full compliance with the regulatory requirements in the life sciences industry. In addition to this, we collaborate with our other locations to also offer services within development, operations and support. We are recognized for our deep life science domain insight and our ability to deliver consistent high quality using our global delivery capabilities. In our US office, job opportunities primarily relate to the above mentioned areas, but if you are an experienced SharePoint developer, IT security or infrastructure specialist we would also like to hear from you. NNIT Inc. offers challenging IT and consulting projects in the life sciences industry and a chance to work with some of the world’s most prestigious clients. "Knowledge sharing is important to me and an integrated part of how we work in NNIT – the more we know, the better we collaborate and the more we can assist each other if necessary. Everyone is very approachable and helpful, both direct colleagues and upper management. I choose NNIT because it’s an expanding global Danish IT company with a good reputation, employee satisfaction and overall stability. I get the possibility to work around the world while maintaining a strong link to my ‘home port’." We offer an attractive salary package according to your experience and seniority. Your dedication and results are additionally rewarded with personal performance bonuses and we have a strong focus on your professional development. Our employee benefit package consists of an attractive health insurance package, 401(k) and starting with more than 3 weeks annual vacation.